I grew up in the country and as much as I love the energy and excitement of city living, there is nothing quite like packing the car and heading back home to be with family. Sometimes this is all it takes to reset the buttons. You leave feeling well rested, re-energized and happily a few kilos heavier – How does this always happen?! Earlier this year, I decided to head back home to Regional, NSW to spend some time with my family and catch up with old friends. On Sunday, we decided to head for what we have fondly named “The hills” to bask in the autumn sun and cook up a campfire feast. Now, “The Hills” is not the reality TV show but rather a stretch of natural ranges officially called, Cocoparra National Park located 25km north east of Griffith, NSW. The Cocoparra range is part of the traditional lands of the Wiradjuri nation and is now occupied by abundant plants and wildlife including parrots, kangaroos and echidnas. I have been going to Cocoparra since I was a young child. We would go on bush walks through the scenic gullies and search out the waterfalls that we could hear from our campsite. We would cook marshmallows on the campfire and make hot chocolate from the water boiling away in the billycan. It is a place of fond memories of time spent with our grandparents, cousins and our closest family friends. It is also a special place where we would test out our culinary skills because after all everything taste better around a campfire! I was particularly excited about this day-trip to Cocoparra as Dad had packed his camp oven (which I found out was one of his 21st birthday presents – check out the photo it is amazing) and Mum was planning on whipping up her wicked chilli prawns. We set up camp at the campsite called, Woolshed Flats which is nestled amongst the eroded cliffs of the ranges and cypress pines. We created our little campfire and Mum kicked off the day-long feast with her specialty, Alison’s Chili Prawns! 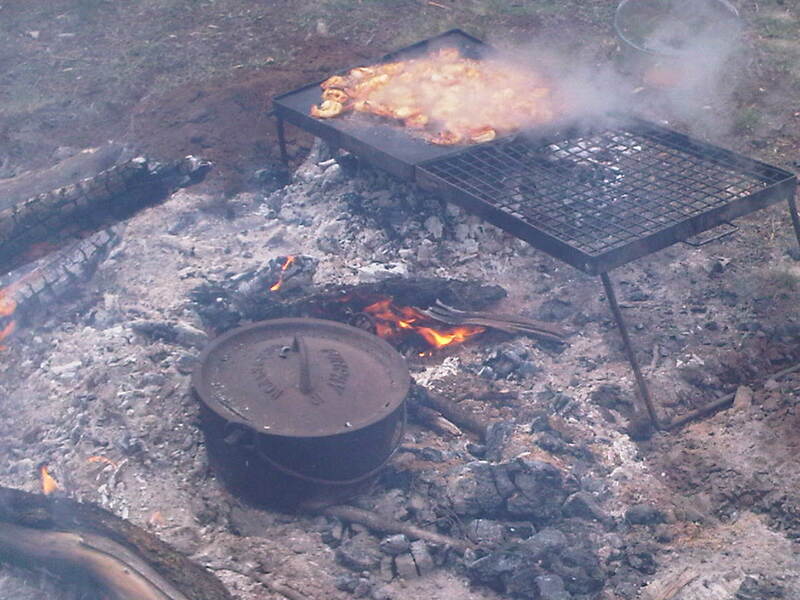 The prawns were marinated that morning and then we cooked them up over the camp stove. Check out the recipe below. The prawns are delicious and super tender with the marinade. Now this is what I call “glamping” (glamourous camping)! With a few other foodie indulgences in between, Dad then finished off the feasting with his old fav, Charlie’s Damper! 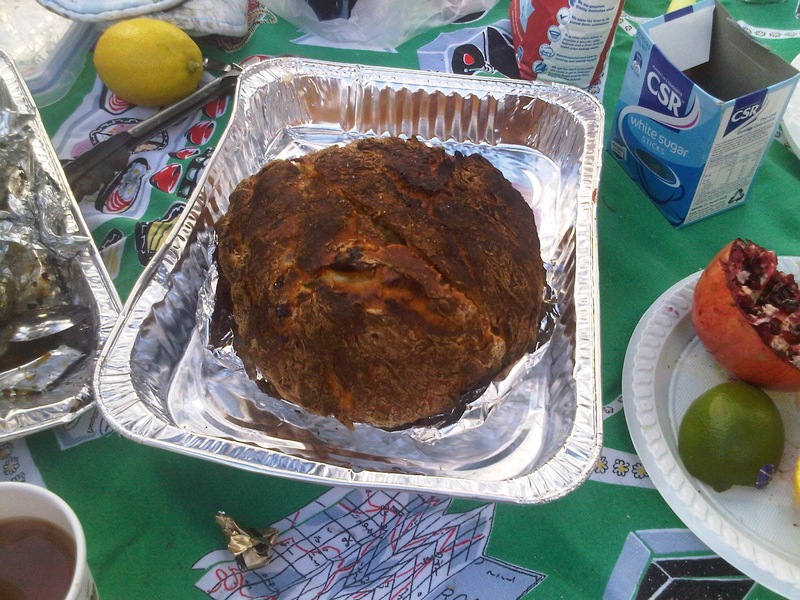 Damper is a camp side staple for us and it is so tasty with butter and honey drizzled over. I have included Dad’s recipe below but feel free to experiment by adding different ingredients. We put a spin on Dad’s damper by adding Granny Smith Apples which we had wrapped in foil and cooked in the hot coals. I hope you get as much enjoyment from these recipes as we have over the years! 3 Green Apples (We wrapped the apples in foil and cooked them in the hot coals at the base of the camp fire) or you can dice the apples and add to the damper mixture. 1. Combine flour, butter, salt , apple (cooked or raw) and cinnamon. Knead the mixture into a soft dough adding the milk as you go. The dough mixture should be soft and fluffy and not too runny. 2. 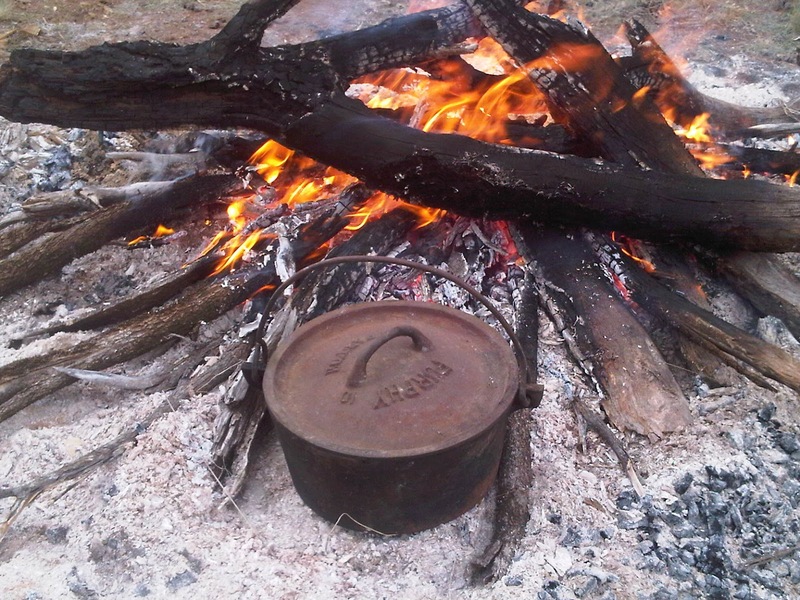 Carefully place the damper mixture into the camp oven and place the camp oven over hot coals. 3. Cook for 30-40mins. Cooking time is dependent on how hot the coals are. 4. Once cooked, take the damper from the camp over and break into pieces. Dress with butter and honey, jam or other tasty conserves. Enjoy warm! 1. If you have defrosted prawns defrost overnight in the fridge. Once defrosted de-tail and de-vein the prawns. 2. Place Prawns in a bowl and coat with wine, chilli sauce, soya sauce, ginger and lemon juice. Mix to combine. Cover and refrigerate. Note: Lemon juice should be added at the end of the marinating process so that it does not cook the meat. 3. Place marinated prawns on a pre-heated cook top (we used Dad’s fancy camping stove but any BBQ or pan will do). 4. Cook prawns for 10mins or until just cooked.